It’s that time of the year again. The roar of the crowds – the hiss and boo of rival supporters, flags and scarves waving gaily in the breeze favouring the scoreboard end…..Collingwood lines up against the Eagles on Saturday, 29 September, at the MCG for the last battle of the season. At White Elephant Records we are leaning towards the Mighty Pies. And then nothing! Life gets boring. No more football……………….!!! But at least it’s a long weekend and on Monday 1 October, the last day of this glorious weekend, Mr V Music is hosting the 15th Semaphore Record Fair. The event will be held at St Bede’s Hall, 200 Military Road, Semaphore (bus stop 44), about 20 metres south of the Semaphore Road / Military Road intersection. Entry is FREE. Doors open at 9am and close and 4pm. This is a street level event, which enables easy access for wheelchairs, prams and other mobility aids, aside from the hustle and bustle of busy punters, competing for gems and bargains. They are a friendly crowd and will make space for anyone who may need it. 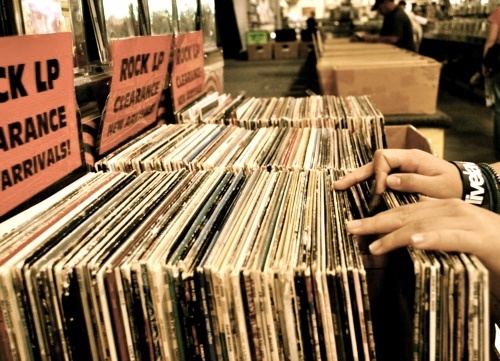 This is possibly the last big record fair for the year in Adelaide. An enthusiastic 30 traders will have 50 tables of stock for sale, including vinyl records, CDs, DVDs, books & magazines, music memorabilia and more. All genres of music will be on sale – the Good, the Bad and the Ugly. One seller will have a wide selection of record player needles & turntable belts along with other hi-fi & stereo system accessories, so bring your old stylus for matching and replacement. It’s easier than trying to do it on-line. Of course Louise and her support group for St Bede’s Parish will be providing hot and cold refreshments at the hall. The coffee is hot, the home-made cakes are delicious and the pies always in demand. Crate-digging bestows its own energy but a little in-take from the canteen can only assist the process. And you can expect lively crowds along the Esplanade over the weekend as Semaphore hosts the 14th annual 4-day Music Festival playing in local venues, including Hart’s Mill Shed Port Adelaide, the Semaphore Workers Club, the Exeter, the Palais and St Bede’s Hall. Over 80 artists and groups from the genres of alt country, Americana, roots, blues, folk and indie rock will fill the airwaves with sound and light. The Record Fair bookends the Music Festival on the last day of the festival. The weather forecast is good and it’s a great time to visit the beachside suburb of Semaphore. Be there or be square. Go Pies! !